Wouldn't you love to instantly have the look of spending a week on the beach? With a spray tan from our Norman OK hair salon you can experience the beauty of gorgeous bronze skin without spending days baking in the heat and without the worry of skin damage from the sun. Our Norvell spray tans are a fabulous sunless tanning system that will nourish your skin so that you can experience maximum results. 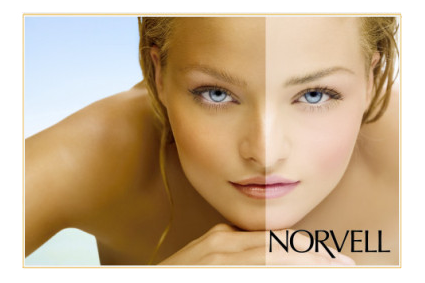 Unlike other spray tans, the Norvell system will NOT turn your skin orange. The formula has the perfect blend of ingredients for a beautiful, natural looking glow that will last for up to a week. A spray tan will normally last 4 – 7 days. A tan received at our salon will last longer than an over the counter product that you use at home because there is a greater amount of DHA in the tanning formula. The "life span" of a spray tan also depends on your skin's natural exfoliation. The faster your skin cells exfoliate, the faster your sunless tan will fade. The spray tans from our salon affect only the top layer of the skin and will begin to fade after 4 to 5 days. Following a good skin care regimen before and after sunless tanning will help a sunless tan last longer. If you exfoliate your skin prior to your tanning appointment and if you keep your skin moisturized afterwards your tan will last longer. Sunless tan-extending products with a light self-tanning bronzer, like Norvell® Pro-long™ tan extending lotion, help hydrate skin and maintain even, natural-looking color longer. After my spray tan, how long should I wait before I shower? Your tan will take about 16-hours to fully develop. You will receive the best results if you wait until the next day after your appointment to shower. If you must shower, then try to wait at least 6 hours after your appointment and do a simple water only rinse. Soap will destroy the DHA that allows the tan to develop. Delayed bathing allows the DHA bronzer sufficient time to complete its reaction with the amino acids (proteins) within the skin. The main ingredient in most spray tans and airbrush tan formulas is dihydroxyacetone (DHA). DHA is an ingredient derived from sugar cane and beets, which reacts with the amino acids in the skin to create the darkening reaction or tan. DHA does not produce a "real tan" by increasing the skin's melanin levels; it creates a tanned effect by changing the color of the surface of the skin. The development of color takes anywhere from 2 to 4 hours and the intensity of color is dependent upon the DHA concentration in the product as well as each tanner's individual skin characteristics. The color developed by the DHA usually lasts 5 to 7 days and begins to fade as the top layer of the skin naturally exfoliates. Visit Mystique Hair Salon for the best spray tan in Norman OK!